Quick! Name the four largest US Stock Exchanges. The New York Stock Exchange, the Nasdaq Exchange, uhhhhhhhhh. There are more? Okay can’t answer that one, how about this question Mr. know-it-all stock investor: The heart and soul of Wall Street is located where? Well you’re right about that but perhaps not for very long. In the next few years the correct answer to the second question may be Secaucus, New Jersey or Kansas City, Missouri. Oh, and those other two exchanges….Direct Edge and BATS. All this has to do with the age of computers and high frequency trading. When we enter our covered call trades and then look to order status what do we see? EXECUTED! How did they do that so fast? People didn’t, computers did. There is a worldwide demand for speed in trading and lower commissions. As a result machines are taking over. Direct Edge is America’s newest stock exchange. It consists of a series of interconnected high speed computers in a warehouse in Northern New Jersey. The amazing stat is that it processes up to 10,000 orders per second and has only 90 employees. Another such exchange is called BATS which is located in Kansas City, MO. It has captured 10% of US market share in just four years. There are some powerhouse players behind these new exchanges. Direct Edge is backed by Goldman Sachs, Citadel Securities, Knight Capital and the International Securities Exchange. It also accounts for about 10% of stock market trading in the US. To combat these growing technological giants, the NYSE has countered with Arca, a new electronic data center also located in New Jersey. Well is this good or bad for us? Certainly speed of execution and lower trading costs are great but there are concerns. High speed trading had led to a new form of trading where algorithms are developed to enter trade orders. These are computerized programs that based on certain criteria make all the buy/sell decisions for the trader. Elaborate decisions to initiate orders based on information received electronically is processed before a human could even bat an eyelash. Believe it or not, some of these programs have the ability to scan certain social networking players like Twitter and react to information gleaned there. To some extent trading has become gaming. 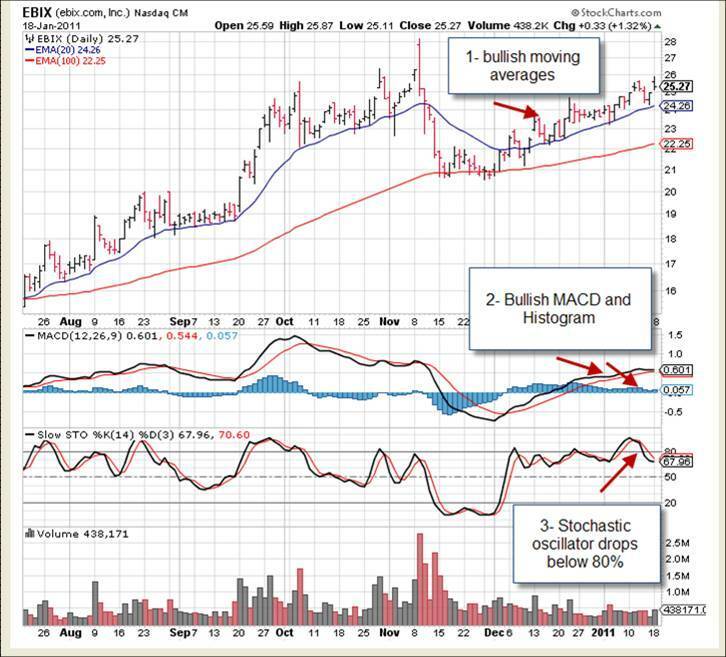 Recently on this site, there was a discussion as to the benefits of using technical analysis in our buy/sell decisions. As most of our members know, I am a huge proponent of using technical analysis as ONE aspect of this decision-making process. This concept was confirmed when I toured the floor of the New York Stock Exchange with my son Craig a few months ago. I was told by a market maker that technical analysis has become a large part of the algorithms used by many of the higher level players. We read our charts, the computers read theirs. In my view, there will never be a level playing field between the institutional investors and Blue Collar Investors. However, that incline is decreasing and the odds are getting better and better for us. We are more educated than ever and paying less to participate in the “game”. I’m okay with that. At the same time, we need to be aware of the changing environment and that is why I decided to write this article. Many of you are probably thinking about the computers and the flash crash of May 6, 2010. The S.E.C IS blaming this on the computers and the new technology of high speed trading. It seems that a single $4.1 billion block of E-Mini S&P 500 futures contracts was sold through a computer algorithm. Billions of dollars of sell orders flooded the market over a 20 minute span. The markets were already nervous because of the debt crisis in Europe. THE COMPUTERS SHUT DOWN! There were no buyers and the DOW dropped 700 points in minutes. There was then a quick recovery and ultimately more than 20,000 trades were ruled invalid. Since then the SEC has installed some circuit breakers where trading will be halted if a stock drops by 10% within a five-minute span. The SEC is also taking further steps to monitor this new age of stock trading. It is truly becoming a new stock market. As we speak there are more projects under construction like the 428,000-square foot data center in Chicago opened by the Chicago Mercantile Exchange. I have oftentimes used the analogy of David and Goliath. We continue to be David and they are now a high-tech version of Goliath. We still have our arsenal of slingshots using fundamental and technical analysis along with common sense to garner a significant share of the pie. There is enough for everyone even in the “new stock market”! I will continue to show this video on this site the week before each contract expiration. The Fed’s January Beige Book reported positive signs in retailing, service industries and manufacturing. Real estate lagged well behind. For the week, the S&P 500 was up 1.7%. Many thanks to one and all for your continued support especially our members who contribute to our blog. This is an extremely valuable tool as we learn from each other in our common mission of becoming CEOs of our own money. Whether you are a frequent contributor or someone who lurks in the shadows we value and appreciate your participation in the BCI community. ***The market is closed on Monday, in observance of the Martin Luther King Jr. holiday. Just remember, while the market may be closed on Monday, the news will not be. Be alert for things that will move your stocks on Tuesday, or provide you an opportunity. It also give you another day to check your watch list. Thanks for the article, Alan. I remember the days when a 100 million share day was news. Now the trading in activity is more than a billion, and the computers are the reason. This also adds to the volatility and option premiums we benefit from. Every month, on expiration Friday, I say a little thank you for meeting you and taking your class. I’ll get in an early one this week. The page gives a good summary of the day/week reports, and the quick search box leads to past earning dates with results as well as the forecast date for the next report. As probably an original Premium Member of the BCI, I am blown away by the absolute growth of this blog. I must say that back then if it had 2 posts a day it was a lot. This past period showed over 90 posts. I have read all of them carefully, and look forward each day to it. And I am also totally pleased that each and every post that I recall was absolutely on the subject, with no flames or other attitudes showing! Thanx to Alan & the team and to all the others. Thanks Alan for this weeks article again. As Owen already mentioned, through computers, the trade volume has increased dramatically. . . and no end in sight. The computerized trading, where well fed programs make the decisions for us, is already there and will play a huge role in the future. If done right, it takes the emotions out of the trading and this will be a big plus. On the other hand, traders with old fashioned trading and evaluations, will be behind, because in the time, you put down your numbers on a piece of paper or your trading log, the numbers and the volatility have changed so much that your trade is has no value any more. For now we are still in good shape, but we have to be open and see the changes and have them work in our favor and don’t fight them. A Thank You also from me to Eric. I found “briefing.com” in my book marks. I had it gotten somewhere, bookmarked it and forgot it. Too much info sometimes and things go under. I’ll have another look at it. Alan is right on about the changing market. It wasn’t that many years ago that we couldn’t even afford the commissions on doing covered calls and execution was slow. Today we have access to what traders dreamed about years ago with streaming and systems that enable covered call writing and closing quickly. I feel like we are on the fringe of all the big trades and magical computer systems. Great site Alan and very helpful. The key is taking your financial future into your own hands and the data you are providing is helping toward that end. Alan, how do view the change of the IBD 100 to the IBD 50? Do you think it will have an even bigger impact on the following of these stocks? Watch the earnings reports dates carefully. Several of the stocks that pass this weeks screens have ER’s that fall in next months contract cycle. Computers? Speed? Yes indeed. I remember selling my first CCs about 30 years ago – and I simply did not follow thru with doing them. Broker trading for this purpose is totally clumsy, and slow, and the brokers really do not benefit from it. And advising you of a fill took even more time. So I am here to say that from that standpoint, today’s system really rocks!! 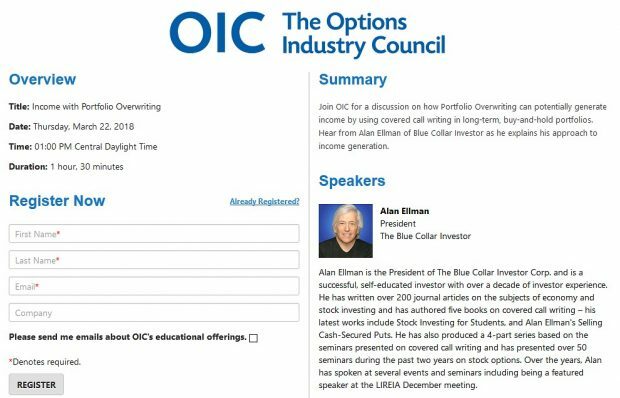 Alan, do you happen to know just where in Chicago that the CME will open its data center? We are originally from there. And I do believe the CBOT was down there on LaSalle Street. I am a newbee so please forgive me,.. The new post of the weekly stocks today has stocks with ER between Jan expiration date and Feb expiration date like CMG ER Feb 10. Should I believe that we are receiving guidance to enter trade between Tuesday (Mon is a holiday) and close of option period of Jan 21. Seem very short or am I missing something here??? I have continued to read …still a newbe!. With the screened stocks of Tuesday 18 Jan 2011, buy stocks and write CC after the ER (if the ER will occur during the Feb cycle..?Please comment on my faulty logic? the stock screen for the premier members comes out every weekend. When the green section, where the stocks passed all screens, says, that there is no ER in this option month, then this is always for the current month. In this case the current month ends on Friday next week. You could enter a trade between Tuesday and Friday, but I would not acquire a stock for this period which has an ER at the end of this month or during next month. If you are not getting assigned on Friday, you get stuck with the stock and it might be difficult to sell without loss before the next exp. Friday. If not,then please keep asking. Since Feb 19 is the end of the FEB 2011 cycle, looks like cxo, jnpr,ntap, are the only soldiers to send out to battle from today’s list… Am I seeing this correctly? I notice two stocks that I have looked over briefly, which look like good candidates. They do not show up, nor have they as far as I can tell, on our watch lists. One is MON and the other is MOS. Both are agriculture. 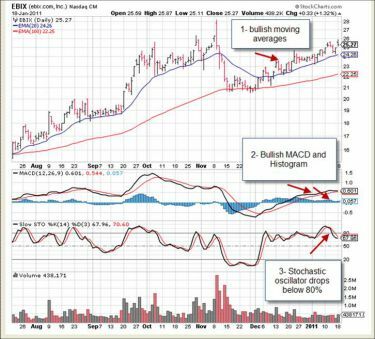 MOS shows a Scouter of 10, with an excellent chart and good volume. MON shows a Scouter of 7, also with an excellent chart, but not as good on Volume. What with writings these days seeming to agree that Ag is up and going up more, I cannot help but wonder why it does not show up on our lists. As you look through the B section today, you’ll find the IBD 50, rather than the IBD 100. We have analyzed the best stocks in the IBD 100 and, more important, the worst performers from this weekly feature. Guided by our findings, we’ve tightened our selection process, focusing on the variables that separate the biggest winning stocks in any cycle from the good but not great names. For readers, this means a list of stocks that not only is faster and easier to study, but also produces a higher batting average of success. You’ll see the very best stocks you’ve become accustomed to, without having to wade through the thinner, more volatile names. The new IBD 50 is a concentrated watch list, worthy of careful consideration each week. Readers should never buy a stock simply because it appears on the IBD 50 or rises to the No. 1 spot. You should always analyze the chart pattern, dig deeper into the fundamentals and read articles about the company to fully understand what sets it apart from the thousands of also-rans that populate the stock market. I know it is the western suburbs of Chicago but don’t have anything more specific. It appears that these equities did not make the IBD 50 list so they weren’t screened. There are approximately 2500 stocks with options so there will always be solid candidates that do not appear on the premium watchlist. One of the benefits of having a blog with the outstanding membership we are so fortunate to have, is that we can share potential additional candidates with each other. As Ron points out MON just misses passing our system criteria but does appear to be a strong stock as is MOS. I took a look at MOS and MON. MON would not have passed the screening this week…it failed the “Fund’l And Tech’l” Screens (SmartSelect). MOS however, did pass all of the screens for this week and can be considered a candidate for the next cycle. I will include it in next week’s report under “Other Stocks”. In the meantime, you might want to take a look at DE, also in the agriculture sector (as are MON and MOS). It has been on the “Running List” for 5 weeks. Tomorrow is going to be interesting. I find it infuriating that Steve Jobs would announce he is taking a medical leave on a holiday when the market is closed. I have a rather sick feeling, too. For all of you beginners or novices like I am, Dave is referring to a short explanation about spreads I gave in last weeks blog. My #91. If you are interested in exploring things, that’s for you. I am a starter like you and am a believer in the solid and easy to understand rules Alan gave us in his books, DVDs and here in these blogs. I am also curious, what else is out there. Mainly because my account is not a big one and I can’t afford to buy stocks in blocks of hundred in five different industry segments. Very good and solid point for a beginner! So, here I am, looking into call spreads and begin to see, if done well and carefully executed, this strategy combines all of Alan’s rules and safety- net features AND let’s someone with a small budget do trades with well researched, but out-of-his-reach stocks. And do covered calls on those. Dirk is correct, but watch out. like I said in my #21 above, things can go bad quickly, and on a day when you cannot trade you are stuck wondering what everyone will do as soon as they can trade. I am curious about those computers taking the holiday off. Your # 21 Owen, and to all other Apple fans. When Steve Jobs announced in Jan 09 his leave of absence, after he first had reassured that he had only a hormone deficiency, the shares dropped about 20 bucks. That was around 5% at that time. If this happens this week, then we are looking at a possible share price of $330. . .
That puts your $335 put in danger Owen, but you are probably watching it like a hawk. Apple’s stock under the ticker APCD in Franfurt/Germany fell by around 17.7 Euro, that’s 6.8% at the time of this writing. Here a little snip from an Apple chart from Frankfurt’s exchange from Jan to today. My only consolation for today is that it survived his last health issue, and tomorrow is an earnings report which should be very good, according to Jim Cramer. Hopefully, the earnings of a company that really is larger than Steve Jobs will offset the matter. Microsoft survived Gates retirement. Apple should be able to survive without Jobs coming to work every day. Apple closed on the Frankfurt exchange at 243 euro, US$323.10 at today’s exchange rate. It is very thinly traded on the Frankfurt exchange, so, I suspect that things will be different in the morning. A lot of talking heads will have gotten in their 1.3 cents worth (inflation) and a lot of investors may realize that Jobs has the health problem, not Apple. We shall see. But apples are healthy. . .
Apple bounce back today at Frankfurt/Germany’s exchange by 7 Euros from it lowest point in the afternoon. As of 7:30 is is almost at 247 Euros again, the equivalent 0f USD 330. In the pre-market trading in the US it went down this morning to $327 and hovers now at around $330 with tendency to #331. Friday I will have my team add it to our premium watchlist. As always watch for earnings report dates and use technical analysis to determine buy/sell decisions. Due to the large number of direct emails I have been receiving of late I am slightly behind in my responses. I should catch up by the end of the week. Post #35: Lunch is on Owen! Dinner is on me. After hours Apple hit $454. Earnings were fantastic. I guess all of those sellers this morning are having an Excedrin night. It’s a beautiful day in the neighborhood……. I lost the link for MSN scouter rating. Has that website changed? Any hints would be appreciated. disregard last post. My internet messed up. Sorry. how did you get the smiley in your post??? I am bugging Alan already for a while to get this feature in here. Looks like our friend regained some momentum. . . I entered the usual semi-colon, hyphen and right parenthesis. It reproduced it as the smiley face you see. If you look closely at it, I believe that it is winking. BTW, Apple is already back up over $338. Unless they announce that Jobs has died before Firday afternoon I think I may be safe with the $335 put. The February put spread, ehhhh, we’ll see. I just became a premium member and received my first report. I have a question about ebix. In week 3, it appears in bold but in week 4 it doesn’t. Can you explain why and how we should use this information. AAPL is above $335, and looks like it will stay there. FFIV is sinking and looks like it will not clear $150. PCLN is rising and looks like it will stay above $420. Sorry. I got ahead of myself. Apple hit $354, not $454,….for now. I am going to do a trial on IBD for the next month. They are still offering the IBD 100 which is now probably the IBD 50, right? What are you guys subscribing to? Which one makes sense right now? Any thoughts on buying AAPL going forward? Careful, Amy. Our opinions of Apple and $1 will get you a McDonalds value coffee. I entered the February spreads last week believing that yesterday’s earnings report was going to be good. Well, it was beyond everyone’s expectations. That said, some people still believe Apple will fall. The Jan $335 puts that I sold are $1.10 with the stock selling at $342. These options expire in 53 hours. I am hanging on to keep the last $1.10, maybe. I am watching it. Sorry, I should have added a bit more for novices. Apple is a great company and Jim Cramer thinks it is a $400 stock. With Jobs health issue the market is nervous. It survived Jobs last health leave just fine, but from the covered call writing, or option spread, perspective, I would be a little cautious about it, at least until next week. That will give everyone time to think about it, discuss it, read their tea leaves, turn their magic eight balls over, etc. My risk tolerance is different than yours. You have to feel comfortable with the stock. If my comments give you some of that comfort, fine, but remember, I have also jumped out of perfectly good moving aircraft. Has anybody some opinion on Google’s ER tomorrow? Thanks Owen, I’ll keep an eye 0n it until next week. Dirk, I get the weekly IBD (Monday edition) and Alan’s premium list. the Monday edition only or also the electronic one? The Monay edition gives access to the website (no extra charge) and you can download the IBD list from this site. I pay about $200 per year (55 weeks). I chickened out on FFIV. Even though it was trading down, around $138, somebody was keeping the Jan $150 call around $1.65. I see absolutely no reason for that with 48.25 hours left before it expires and the stock $12 below the strike price. It does not make sense, except that perhaps someone thinks tonight’s earnings are going to be good and the stock will pop tomorrow like it has after the last two earnings reports. I’m out. I made a profit, albeit much smaller than I expected or wanted, but I don’t want to risk it. I WAS ROBBED!!!! FFIV tanked $20 in after hours trading. The earnings must have been a bit diappointing. Well, that’s life in the Blue Collar Investor world. Better to keep a small profit than incur a large loss. Doesn’t comfort me too much, but it could just as easily have gone the other way. This is why Alan tells you not to hold a trade through an earnings report. Apple went through the roof yesterday and fell back today. F5 Networks fell through the floor today. There is no predicting what the market will do to a stock. F5 is still tanking Owen. Didn’t we have a bet for a dinner running in regards to FFIV? On November 2nd this company reported a 3rd quarter earnings report with a 90% positive surprise. It has boasted a 139% average surprise over the past four quarters leading to a new all-time high recently. Revenues were up 44%. The balance sheet shows cash up $45M from last year with no long-term debt. The fundamental ratios are pricey with a PE of 71 and a PEG of 2. The share price has dipped about 6% since hitting the new high. Check to see if this equity deserves a spot on your watchlist and use technical analysis for your buy/sell decisions. Amazing how quiet this blog is! Is it the market tanking or all of us scratching our heads trying to figure out what to do. I had (I thought) all my ducks lined up and then the **** hit the fan. I can’t speak for others but I have my hands full today making decisions on what actions to take today and Friday. I am looking at a new postions in FFIV: bto and sell the Feb 100 call. Yeah, some pricey spread candidates got hammered. With 1.5 days to go, I was pretty comfi today and then . . . ., but that’s trader’s life. Do a damage review and invest and make money with the downers. I think Owen bailed out of his Apple put too. Not sure, but if not, he is very brave and might be lucky, because it might make it back to $35. This is one stock I own. For some reason unknown to me its had qute a bearish day. Its gone down 5.7% (or $2.56)… Now this stock reports earnings on the 27th of january but maybe some informaton has leaked earlier or something. Can anyone share nformation on why INFA has dropped?? FFIV I have 2 140 covered calls made $1150. did 5 of the 150/160 call spread made $665. and lost $2505. on the stock price drop for a loss of $690. as of now. For a drop from 145 to 110 I’m lucky to only lose that much. 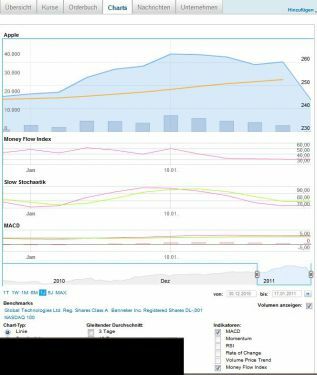 AAPL I have a 330/325 put spread. I thought once I survived Jobs and earnings I was in the clear. Hopefully it will stay above 330 for another 24 hours. Re my FFIV post, I just realized that the $2505. loss was per contract so I lost $5010. on stock price drop for a net loss of $3195. Ok, just for the record I still believe in Apple. I am still short the Jan $335 put, but I will consider bailing out before 4PM tomorrow. I do not want to own 500 shares of Apple at $335 per share. I still have the Feb $330/$320 put spread, and I am keeping my fingers crossed that today was just a “let’s dump the tech stocks” day. I saw a discusssion from Jim Cramer who said that everyone overdid the flogging of FFIV. It settled down today, so I bought the FFIV Feb $105 call for $4.20, and sold the Feb $110 for$1.57. The stock was around $107. The stock came back up to $110 and I am already ahead $200 in a couple of hours. Nice work if you can get it (and KEEP it). Looks like the whole information sector got hammered today. Did you bail out of your call spread at FFIV before the ER? If you don’t mind, I’d like to share some info via e-mail. RVBD is scheduled to report on 2-2 in the heart of the February contracts. If the stock is still trading above $35, I will allow assignment. IDCC is scheduled to report on 2-25 after the 2-18 expiration date. If I rolled out today when the stock is trading at $47.54 to the February $45s I would generate a 2.8%, 1-month return with a downside protection of 5.3% ($2.54/$47.54). These numbers will change a little between now and tomorrow but if you feed the numbers from the options chain into the Ellman Calculator you can monitor the returns and protection. FFIV: I rest my case when it comes to avoiding earnings reports when covered call writing. That is one of his primary rules. The next one is avoid companies that issue same store sales reports. The reason behind that one is that they often issue them monthly which makes planning the options sales difficult. Also, AVOID EARNINGS WHEN WRITING OPTION SPREADS (or when the CEO has health problems). For a company that had a blowout earnings report Tuesday, Apple has performed very poorly today. *At support level with 7 points of validation. If we bought the stock now and sold the FEB strike 11 CALL (28 days till expiration) we would have a ROO of 3% and downside protection of 5.3%. *Fundementally Not great, but not bad. * This stock has been channelling sideways for the last 2 years. * Its currently around support zone ($35). There are 5 ponts of validation at $35 in the last 2 years, with the exception of 2 times when it went down to $32. *The last 2 days have shown a bullish engulfing pattern. *Uptrending MACD, negative stochastics, Uptrending CMF. * If we bought the stock now and sold the Feb 35 CALL (28 days till expiration) we would have a ROO of 2.4% and downside protection of 0.9%. I just rolled out for TIBX. I bought back the 21 option for 50 cents and sold the feb. 21 for 1.20. 70 profit on 21 stock value is a 3.3% profit with 2.4% protection as stock traded at 21.52. Glad I have the calculator! Watching it carefully. Bought it on 1/13/11 for $39.84, sold the FEB 40 for $1.00. RVBD tanked this week on FFIV’s earnings report. BTC FEB40 yesterday for $.05. As Alan said RVBD earnings due 2/2. RVBD creeping back up. Will sell as close to breakeven next week. Buying back the option below 10% gives maximum flexibility for exit. I could have waited and let it expire but you never know when you need to ‘pull the cord’ on the parachute. Expiration Fridays can be strange. Still hanging on to my short position of Apple Jan $335 puts. The stock is hovering around $329-$330. I have this naggin feeling that someone is going to run this up a bit just before closing. It looks like I will lsoe some money. I am just trying to mitigate how much. 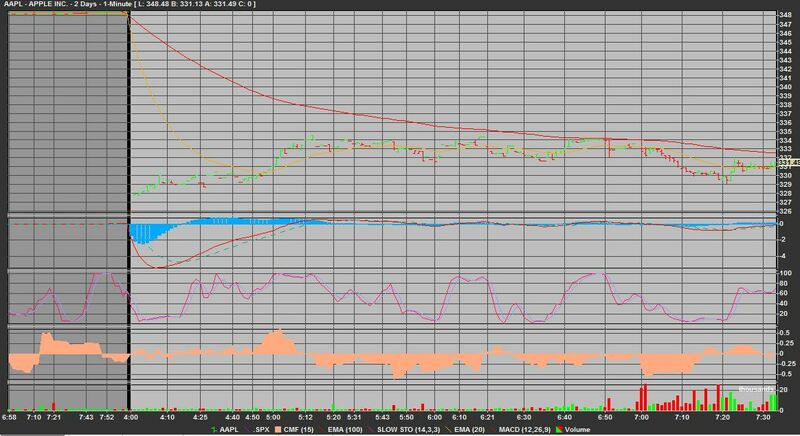 On the other hand, buying the FFIV Jan $105 call and selling the $110 looks like a winner already. I may even close it today for a 24 hour profit of a couple of hundred dollars. I was not brave enough. . . The sell-off at Apple is amazing. You think some institutional guys will buy at a huge discount before closing? The volume today is already 15.7 million shares. The average for the last 0 trading days is14 million shares. I agree with Dirk. A bit confusing, but someone out there is trading like mad, and making me madder. Oh, well. Can’t win them all. You have to willing to take a loss or you should not even consider trading anything in the stock market. Just sent you one, Mark. A final word regarding my post from yesterday (#61). RVBD is up today. I will allow assignment @ $35 due to the impending earnings report. This means that my 1-month 3.4% profit is protected as long as the share value does not depreciate by more than 4.3% in the next month. As always, I am prepared to institute an exit strategy (as Ed did in # 66….nice job Ed) should this stock “misbehave”. I did something similar like Alan with my IDCC. 2 days ago I rolled out and up. As you can see, Alan did the more solid deal. My downside is already gone and he can lean back and have a nice Friday evening dinner. This week’s report of top-performing ETFs has been uploaded to your premium site and is available in the “resources/downloads” section. Look for the report dated 1-21-11. Closed my Apple $335 puts. Nuts. I was sure Apple would close at $335.01 just to irritate me. It didn’t. It closed at $326.72. For those of you who thought trading a day or two after the earnings have come out would be safe, let this be a warning. Close any position you have a few days before earnings (or don’t trade it at all that month), and do not be in any rush to hop back into the stock immediately after the earnings. Let the market settle down and figure out where it wants to go. one of the excuses for Apple’s drop is that the stock had been run up IN ADVANCE of the earnings report and people were taking profits. Apple had terrific earnings, jumped up, and then collapsed. FFIV had lousy earnings, dropped 25%, and then bounced back enough for me to cover part of my loss for hanging on to the Apple spread. Go figure. I didn’t follow Alan’s rules. I lost some, and made some, about even this month. Alan followed Alan’s rules. He made some, and kept it. My mother always said I would be an example for others (not necessarily a GOOD example, but an example). Anyway, the wekend is here. I get the IBD tomorrow and start to plan my attack for Monday and see what little bits this crow can pick off in the next few weeks. FFIV closed at 109.97. Anybody holding the $110 call lost, by THREE CENTS. I had bought the $105 and sold the $110, but I closed them both out when FFIV was over $110 during the day. I actually made a profit on BOTH legs! If I had held on and allowed execution, I would own 200 shares of FFIV over the weekend. This is why it is important to completely understand what can happen in a trade, given a price below, at or above the strike price, if you hold on until after 4PM on expiration Friday. Don’t trade and then go on vacation to Timbuktu for a month. It can cost you. One thing I learned this month was that you can’t get out of a position when there is an earnings report coming. I was in FFIV since last month and stayed in it because it was going to be added to the S&P 500 at the first of the year and I thought that would drive the price up. My plan was to get out before the ER date however the premium never went down it went up from the first of the year till the day of earnings when the **** hit the fan so of course I said ……………. and further more I am going to try to go ITM the month before so it can get assigned so I don’t have to risk selling it. Example I did a VMW $100 covered call. It didn’t hit the strike and the stock dropped because of FFIV. Now what do I do with the stock with earnings on Monday? The earnings report is probably after the close on Monday. After this last week I would seriously consider letting it go. You are wrong when you say you can’t get out when an earnings report is coming. You can always get out as long as the stock is above zero. You might not get out with a profit, but you can get out. As I said in my post #69 above, “You have to be willing to take a loss, or you should not even consider trading anything in the stock market”. The whole point is to make the losses smaller, and less frequent, than the gains. You of course are correct I didn’t want to get out at that price. Now, for full disclosure after a hectic day I am reviewing what went wrong this month and of course hindsight is 20/20 but all of my losing trades I can see where I didn’t follow the rules from earnings report to not passing all the screens and I traded anyway to rolling up in the same month. 1) Diversification: It youve bet the farm on 1 stock, you may stress a little…Always diversify! 3) Sell covered calls: This lowers your cost basis of stock, hence lowers risk. This provides better nights sleep! If you understand game theory, Alan’s system uses the mini/max criterion…that is his system will minimize your maximum loss. This is another way of saying what Owen said in post #80. With the BCI system, you have the tools to help you with most situations except negative news and geopolitical events. No system can totally protect you from these adverse events. Hmmmmmm, “Alan is Yoda”…….hope he didn’t mean this….. Sometimes I don’t take my own advice, or the advice of wiser minds than mine. Many professional traders will tell you to set a loss figure and stick to it. It may be a stop loss order, or simply a post-it not on your computer screen: “Apple hits $338 or below: CLOSE THE POSITION”. Don’t think about it. Don’t recalculate it. Don’t start boiling tea leaves. Close it. Move on. I failed to take that advice. It won’t happen again. From now on, when I enter a trade, I will write it down in my trading notebook. Next to it, in red, will be a stock price that will result in closing the position. You should be honored Alan. Yoda was a wise man. I don’t know if you have his green blood, but certainly we all would like you to have his lifespan. At about 15:30 I saw the huge selling and thought, that the big guys just gather their strength to buy back at a huge discount. I was absolutely convinced seeing the stock going up in the last half hour. Through some technical difficulties I was only able to BTC about 10 Min. before close. Now I am licking my wounds and collecting all my after-expiration data to see how much money I made to ease the pain. I told myself a number, when to get out, but revised this number 2 times. The human being only learns through pain. . .
primary objective was solid returns and capital preservation. So, I move to longer calls with significant downside but did lower the annual return to the 20% level (achieved 21% on total portfolio 2010). I had stayed away from short term calls but had been in contact with Alan last year. At this point I have decided to dedicate a portion of my portfolio to the shorter calls and follow Alan’s advice. No doubt, if you are going to play the shorter calls it’s essential you have a resources like the Blue Collar Investor or for sure you can quickly lose a lot of money getting hit. It appears that the IBD 50 seems to really follow the Russell 2000 in terms of overall performance (up 25% last 12 months and down around 2% YTD). Very close to my portfolio of IBD stocks. So look forward to playing the shorter term but do have a balance of various expiration times in my portfolio since I am retired and this account serves as my cash generator for living the good life in retirement. Thanks Alan and team for all the great data. Finally, we face another challenging week with more earnings reports. Should be interesting. Trade #1 makes $2k, trade #2 gains $3k, trade #3 makes $5k. Okay that’s $10k total. Now on trade #4 he loses, say, $4k. Now I see that as a 40 percent loss ratio, because the loss was 40% as much as he had already profited. The question is: How much heat should one take before he gets out of the kitchen?? Expressed another way would be that of: At what percentage point does one think his losses are just part of the game, and at what point does he get disgusted? This is provoked because of the blogs lately about attitudes towards losses. And of course tallying year end results. Personally I always figure the losses simply go with the territory and that the bottom line, overall, is what counts. For me, that bottom line has been just fine – but then I begin to wonder. Comments? The point at which you bail on a loss is not your net for the year. It is the loss on a particular trade. I am willing to accept a loss of 8% on a trade. I invest $10,000. The trade is down $802. I close it. That’s it. Forget it. Move along. There’s nothing to see here, folks. Here is why. If I lose $800 on this trade, I need to make 2% on four other trades just to cover this loss. I can be wrong on 20% of my trades, but I will only break even. Maybe the 8% should be 6%. Another way to look at it is using the stock price of the underlying security. I entered the trade with the stock at $48, and I will make money as long as it stays above $46.50. So, if the stock drops to $46, or $45, I am out. Your bail out point is a personal decision. The important issue is to decide in advance, when you enter the trade, the point at which you will get out. I could have gotten out of the Apple $335 puts at any time on Wed when the stock did not fall below $335. I insisted on holding out for the whole gain, and wound up losing more than a thousand dollars when the stock was down around $330. Dirk hung on too long. Some people are still hoping on SCSI. Each trade is its own little world. It lives or dies based on the stock price, not how much you already made or lost this month, or this year on other trades. Pick a stock price, or a percent loss, write it down, and stick to it. This is a business. If you can sell two thousand A widgets for a profit of $1 each, but nobody is buying B widgets, get rid of the B widgets and buy more A widgets. It’s simple math, but it has to overcome our natural tendency to refuse to admit we were wrong. Your EXCELLENT writing in #89 prompts me to adopt an exit number. So will do – and I admit I had not been doing so. What provoked that post, tho, was my attempt to understand the success ratio of my efforts for 2010, hence my para on ratios. Sorry I did not say so. Your additional comment welcome. Most of the losses I sustained were in the stocks as they dropped, not the options – as Alan has pointed out in his writings. On your exit protocol, if I may construct an example. Buy a stock at $40, sell an OTM call for 1.00, your breakeven would be 39.00. But 8% of $40 is 3.20. Therefore you close out when the stock goes to $46.80? For a loss on the stock of 3.20 but a small gain on the option. Yes? There are a variety of coming up with a target. My choice is using net figures. If I pay $40 for the stock and get $2 for the call I have SHELLED OUT a net of $38. That is my “breakeven” point. below that I start to lose money. If I decide that I will accept a maximum loss of 8%, then I will multipy $38 by 8%, come up with $3.04. Subtracting that from $38 I get $34.96. At this point, I would not be concerned about the option gain, or loss, because any stock price under $40 will not get called. Again, this is just setting a target on the exit door. If you want to make it $35.13 because you do not like even numbers, fine. If you want to make it $34.95 because that is the point at which the drop is greater than 8%, fine. You just want to set a target that you are willing to execute if the deal goes bad. That does not mean that if it only goes to $34.98 you will hang on becuase you still have a two cent profit. I have also sold profitable positions at the same time I bail out of unprofitable ones. I do this because I am taking a loss, and taking a profit is comforting, but it also locks in an offsetting, or partially offsetting gain, so that the profitable can’t follow the unprofitable one down the drain. Don, there is no predicting what an option price will do given a particular stock price and time to expiration. My best suggestion is pick a stock price you are going to get out at, and whatever the option price is will not matter. Unwind the positions and move on to greener pastures. Thank you kindly – your #91 shall be my new approach from here on out. I shall print it as a keeper. Do you ever make exceptions due to the particular industry or sector your stock is in? For instance, these days the precious metals mining sector is laying an egg. Yet it seems almost inevitable that it will rise, and dramatically at that, since the bull market does not seem over. And since the guv is making mincemeat out of our currency. Of course, I make exceptions, Don. That’s why I got burned on the Apple $335 puts. I think I will make fewer exceptions, but I will probably still make them. Look what happened with FFIV. The stock settled at $109.97! Not $109.10, not $110.02, $109.97! That cannot be an accident. If I had kept the $105/$110 call spread, I would have bought 200 shares at $105. Period. No sale at $110. I would have kept the premium for the $110 calls I sold, but I would have been at the mercy of whatever happens this weekend, and wherever the stock opens on Monday morning (which I will be curious to see, first thing on Monday morning). Any trading strategy is subject to adjustment. The problem is deciding if you are making the adjustment based on information that really matters, or if you are just looking for an excuse to avoid admitting this trade failed. It is generally safer to follow your original rule. Stock hits $37.50, trade is unwound. Period. Move on. We have seen several examples this month that reinforce Alan’s rule of no trading in an earnings month. You can get smacked around even before the earnings come out. You can get smacked around days after everyone knows what the earnings were. Does that mean we NEVER trade in an earnings month? No. Does it mean we should not be surprised if we take a loss for doing it? Yes. Does it mean you will always lose if you trade in an earnings month? Of course not. However, if you will lose nine times out of ten, or eight times out of ten, why risk it for that on or two times that will work out? There are a large number of other choices that are not reporting earnings. Go pick one, or two. Just be sure you set an exit point, and stick to it. Also, this does not mean you cannot raise your exit point. Just as you would set a trailing stop loss, you can raise your exit point so you don’t let a gain turn into a loss. If my breakeven point is $38 when I bought the stock at $40, and the stock is now $52, there is absolutely no reason not to raise my exit point to $48 or $50. Apple hit $348, just a couple of days before it hit $326. If you bought Apple at $335 with an exit of $330, and you let it go to $348 with the exit still at $330, you lost $5 on a stock you could have taken a $10 gain on. When I went to Las Vegas, I would bet on the first 12 numbers and the third twelve numbers, instead of red or black. Yes, I reduced the payoff, but I increased my odds by covering 24 of the 36 numbers. If I set an exit point on my trade I can reduce the odds of taking a loss, or reduce the size of the loss I will take. If I move the exit point up as the stock moves, I can assure myself of a gain, even if it isn’t quite as much as I thought I could get, or wanted, I will still get out with the gain, and move on. A sincere THANK YOU for all your efforts herein. I have also printed as a keeper your #93.